June 25, 2010, Addis Ababa: The U.S Agency for International Development (USAID) and implementing partner John Snow Inc. (JSI) in support of the Ministry of Health ,are launching a three-year, $4.85 million Urban Health Extension Program expected to benefit approximately 2.6 million Ethiopians living in 19 cities and towns in the Amhara, Oromo, SNNPR and Tigray regions. The Ethiopian Government has designed this new program to improve access to health services in urban areas throughout the country by training and deploying one nurse for every 500 households. The program will provide services to household, neighborhood, school and youth centers. The launch ceremony will take place at the Hilton Hotel at 8:30 AM on Friday, June 25. USAID Ethiopia’s Health Officer Ms. Meri Sinnitt and the General Director for Health Promotion and Disease Prevention of Ethiopia’s Federal Ministry of Health, Dr. Kesetebrihan Admasu, will be the keynote speakers. The Ethiopia Urban Health Extension Program (USAID/UHEP) is funded through the U.S. President’s Emergency Plan for AIDS Relief (PEPFAR). UHEP aims to strengthen the ability of urban health extension workers to identify the most at-risk populations in their communities and provide public health services to improve their overall health situation, including through HIV prevention, care, and support services. ADDIS ABABA, 20 April 2010 (IRIN) – Almost a quarter of Addis Ababa residents have no access to toilets, says a new report by the Addis Ababa city authorities. “We estimate that some three million people live in Addis Ababa. Out of this nearly 25 percent of the population have no access to toilets and defecate in rivers crossing the city” the report says. “We cannot tolerate any more waste in rivers and roads. We should be ashamed. We want to make sure that the city is clean and a better place to live,” said Mekuria Haile, a senior local government official, at the launch of the report entitled: Cleaning and Beautifying Addis Ababa: Intensifying Environmental and Health Issues with Public Participation. “Addis Ababa is one of the biggest cities in sub-Saharan Africa… but is still fighting against solid waste management and health problems posed by unsafe drinking water and inadequate sanitation,” said Haile. The outbreak of acute watery diarrhoea (AWD) which hit most parts of the city in August 2009 “was the result of poor sanitation and hygiene, coupled with solid waste from the city” the report said. “I cannot trust the water that comes through a pipeline since that outbreak. I boil my water every day before serving my family,” said Senait Habte, a resident of the city’s Kolfe Keraniyo slum. Public relations chief at the Water Resources Ministry Bizuneh Tolcha told IRIN nearly 66 percent of the Ethiopian population has access to safe drinking water and 56 percent has access to a latrine. “According to our water tests, the water in Addis is very clean but the problem is contamination due to its unsafe use,” Tolcha told IRIN. The UN Children’s Fund (UNICEF) says 60-80 percent of the current disease burden in Ethiopia is attributable to environmental health risks, which include poor hygiene and inadequate sanitation. US-based NGO Catholic Relief Services (CRS) and its partners have been promoting an ecological toilet called the ArborLoo, designed by Zimbabwean Peter Morgan specifically for African conditions. 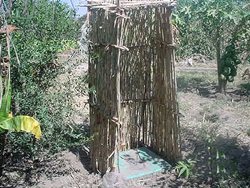 It serves both as a basic toilet and makes use of excreta for growing fruit trees. The AborLoo is a single pit shallow compost toilet 1.0-1.5m deep comprising a ring beam, slab and structure. “Each concrete toilet slab costs US$7-20 and anyone can use it. It best suits the elderly and disabled people. You can dig it in half a day and can also plant trees on it,” says Bekele Abaire, programme manager at the CRS office in Ethiopia. During use, fly and odour problems are reduced by regularly adding soil, wood ash and leaves to the excreta in the pit. Once full, the old toilet site is covered with soil and left to compost with the parts of the toilet being moved to another place, rebuilt and used in the same way again. A tree is planted on the old site, preferably at the start of the rainy season, after the old pit contents have composted for a while. “All of my family used to defecate at the back of our house or in an open field. This is the case everywhere in our `kebele’ [district]; it is normal. We now understand that latrines are important for our hygiene and health. ArborLoo has helped us a lot. We plant fruits, vegetables, trees and above all we are safe from acute watery diarrhoea and other diseases,” said Seid Abdo who is now using ArborLoo in Arsi Zone, Oromiya Regional State. “Many communities achieved 100 percent sanitation coverage in areas that had 1 percent or less [coverage] before the project. And surprisingly none of these areas were affected by AWD, while others suffered from it,” Bekele told IRIN. “We are trying to implement more eco toilet projects in Addis Ababa. We want to scale it up in urban areas like Addis Ababa and Adama but we are challenged by lack of adequate policy and lack of funding,” Bekele told IRIN. USAID Global Development Alliance. (2010). Safe Drinking Water Alliance – Experiences in Haiti, Ethiopia, and Pakistan: Lessons for future water treatment programs. (3) an emergency relief model in Ethiopia. In Pakistan and Haiti a combination of behavior change communication activities and PUR-branded messages and materials were disseminated to increase the demand for water treatment and to introduce PUR. In both countries, CCP led the behavior change campaigns, while in Haiti PSI handled the specific promotion and distribution of PUR. In Pakistan, P&G focused on creating demand for PUR. In Ethiopia, CARE staff working in the Community-Based Therapeutic program were fully in charge of introducing PUR and providing the motivation and information for its use. In all three contexts SDWA partners also studied barriers and facilitators to sustained water treatment behaviors, as well as reactions to and use of PUR specifically. Findings have clear programmatic relevance, and add to the emerging literature on water treatment behavior and the adoption of new technologies, and particularly provide insights about feasible directions for PUR. Old truck tyres never die, they just turn into sandals. For decades that has been the tradition in Ethiopia, where everyone from farmers to guerrilla fighters has fashioned worn-out road rubber into cheap, long-lasting footwear. But now, thanks to a young woman entrepreneur who has combined the internet’s selling power with nimble business practices more often associated with Asian countries, the idea has been turned into an unlikely international hit. By adding funky cotton and leather uppers to recycled tyre soles, Bethlehem Tilahun Alemu has sold many thousands of pairs of handmade flip-flops, boat shoes, loafers and Converse-style trainers to foreign customers. In the run-up to Christmas, workers at the soleRebels “factory” – a small house on the outskirts of the Ethiopian capital – were frantically cutting, sewing and gluing to fulfil internet purchases from customers as far away as Canada and Australia. Alemu’s brother packed pairs of cotton and suede trainers into a box about to be couriered to Amazon.com, the company’s main customer, which receives the shoes in the US three to five days after placing its bulk order. “We are sitting in Addis Ababa but acting like an American company,” said Alemu, an excitable 30-year-old former accountant who is fond of reeling off the numbers that illustrate her firm’s rapid growth. Just five years after start-up, soleRebels employs 45 full-time staff who can produce up to 500 pairs of shoes a day. More will be hired after next month once the footwear range, priced between £21 and £40, goes on sale online in the UK and Japan on Amazon’s new footwear website javari.co.uk. The company’s sales target for 2010 is an impressive £300,000, but Alemu’s ultimate goal – one she seems deadly serious about – is far loftier: to become “the Timberland or Skechers of Africa”. The success of soleRebels, which has thrived in the global market with no outside support other than a government line of credit to help meet large orders, is challenging preconceptions both about Ethiopia and the best way to lift its people out of poverty. 30 December 2009 – Ministry Public Relations Directorate Director, Ahmed Imano, said at a consultative forum organized to health experts on ways of implementing urban health extension program that efforts are being made to deploy over 5,000 health extension workers in urban areas. He said some 3, 749 health extension workers are being trained so as to attain the set target. He finally called on all health professionals and pertinent bodies to contribute share for the efficient realization of the program. Ministry Disease Prevention and Health Development Directorate Officer, Abate Benti, on his part called on the public to take active part in the program in order to repeat the results attained in rural areas in urban areas as well. He said implementation manual and curriculum have been distributed for the efficient implementation of the program. Some 722 health extension workers have already been deployed in Addis Ababa, he said, adding 773 of the 1, 468 recruited nurses are also receiving training. He further said training of trainers (ToT) has been offered to 100 health professional drawn from Harari, Amhara, Tigray, SNNP and Oromia states as well as Dire Dawa and Addis Ababa administrations. Health professionals drawn from the Ministry of Health, Addis Ababa health bureau and pertinent bodies attended the half-day consultative forum organized jointly by Walta Information Center and Ministry of Health.